The transit of Sun will come on 16th November. 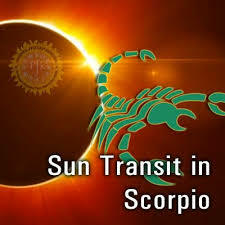 The Sun will enter in Scorpio sign and stays in same zodiac for one month. Aries: Aries zodiac can face health problem. They can face some opponents. They also face some financial losses. Taurus: The transit of Sun is beneficial for their professional life. Taurus zodiac perform very well at work place. However, they can face some problem in personal life. Gemini: Gemini zodiac can get benefit from their efforts. They can defeat the opponents and move forward. They can face some small problem. Their health remains good. The financial condition will improve. The prosperity will increase. Cancer: During the transit of Sun, Cancer zodiac can get financial benefit. However, they can face some problem in love relationship. There are yoga of job change. Leo: The material happiness will increase. The social prestige will also increase. However, Leo zodiac can face some problem in personal life. Virgo: During the transit of Sun, Virgo zodiac can face some conflict with others. However, they can get some financial benefits. Libra: Libra zodiac can face health problem. There can be conflict in family. The income will increase after your effort. Scorpio: Scorpio zodiac can face health problem. There can be up-down in career. Sagittarius: Sagittarius zodiac can face health problem. The expenditure can increase. They can do some mistakes. Therefore, keep patience and take care while doing work. Capricorn: The transit of Sun is beneficial for Capricorn zodiac. The achievement will increase in career. This will increase your self-confidence. They can get some good news. Aquarius: During the transit of Sun, Aquarius zodiac can make progress at work place. However, they can face some problem in marital life. Pisces: The transit of Sun increase struggle of Pisces zodiac. They can face conflict. However, keep calm and face the problem. How Will Changes In Jupiter Affect Your Life?